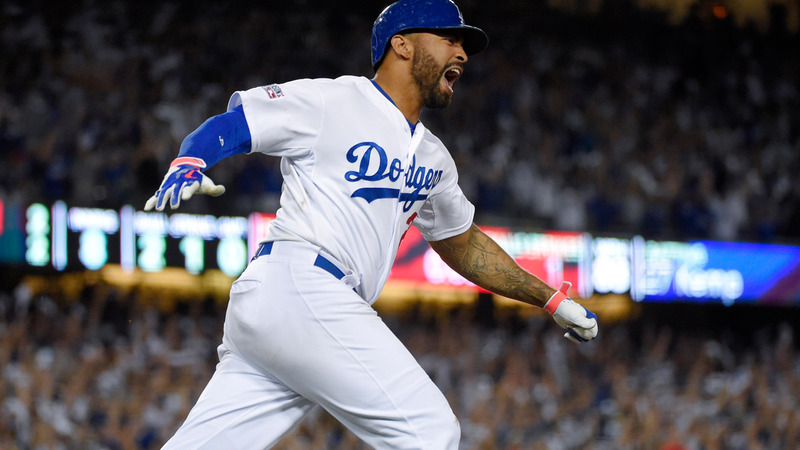 LOS ANGELES -- Matt Kemp is returning to the place where he began his major league career, reacquired by the Los Angeles Dodgers on Saturday as part of a five-player trade with the Atlanta Braves that creates more financial flexibility for the reigning NL champions. "This allows him the opportunity to go and find some playing time," new Braves general manager Alex Anthopoulos said. Los Angeles was looking to reduce baseball's highest payroll of $240 million last season as a way of lowering exposure to higher luxury taxes. "It puts us in an even greater financial position going forward and going into next offseason as well," said Anthopoulos, who was hired from the Dodgers. Moving Kemp opens up a potential roster spot for top Braves prospect Ronald Acuna, who turns 20 on Monday. He was the most valuable player of the Arizona Fall League and Baseball America's minor league player of the year. "We expect Ronald Acuna to be a very good player for a very long time," Anthopoulos said. "When he's ready to go, we're going to look to make room for him and certainly a deal like this won't hurt." Kazmir didn't pitch last season because of a hip injury, one of many in his career. The 33-year-old left-hander went 10-6 with a 4.56 ERA in 26 starts in 2016, his first with the Dodgers. He is owed $15 million in 2018. "I spoke to him and he's pretty encouraged and excited about the work he's been able to do in the offseason, so we're excited to get a look at him in camp," Anthopoulos said. "If we can get him back and he can bounce back, there's certainly some upside there." McCarthy was added to the Dodgers' World Series roster after missing the first two rounds. He gave up a home run in extra innings of a Game 2 loss to Houston in his only appearance. He is owed $12 million in the last year of a $48 million, four-year deal. Anthopoulos said he sees McCarthy being in the Braves' rotation, which needs a veteran arm after not re-signing knuckleballer R.A. Dickey and releasing Bartolo Colon during last season. "He came back at the end of the year and was on the World Series roster because of how good he looked, how good his stuff was, up to 94 (mph) and he started throwing a slider that he just added at the end of the year," Anthopoulos said. "I'm excited about him, think there is an upside to him."